Went to the British Museum. Short on cats in the Viking exhibition but upstairs was a very entertaining storyteller. 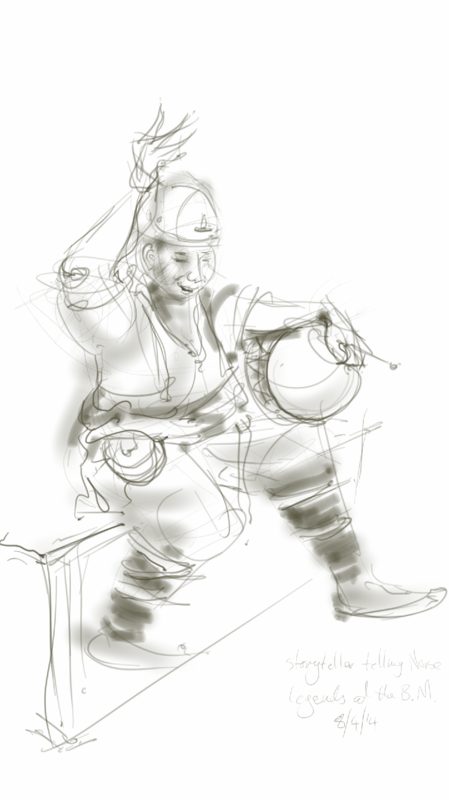 This entry was posted in Events, Uncategorized and tagged art, british museum, digital sketch, drawing, illustration, life drawing, storyteller on April 8, 2014 by Nancy Farmer. All true Wendy … but I was meeting my sister there and having lunch first and so the timing worked well -(though expensive) The storyteller was upstairs with the Sutton Hoo stuff.Have a Viking cat to upload when I can!